3 Autogramme und eine Insert Card per Box !!! 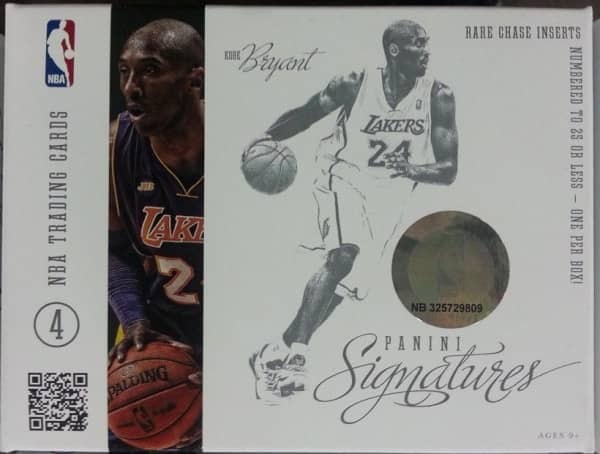 Produktinformationen "2012/13 Panini Signatures Basketball Hobby Box NBA"
Signatures Basketball delivers Three Autographs in Every 4-Card Pack! Featuring the Panini Basketball debut of Autographed Film Cards! Collect an expansive 200-Card Autograph checklist in Signatures and Signatures Film Versions! Look for Die-Cut Signature Cards of 150 of the League's top current and retired players! SIGNATURES: 200 PLAYERS WILL BE FEATURED IN SIGNATURES. LOOK FOR 50 VARIATION VERSIONS FEATURING ALTERNATE PHOTOS. SIGNATURES DIE-CUT: LOOK FOR THIS SPECIAL DIE-CUT AUTOGRAPH CARD OF THE LEAGUES MOST EXCITING PLAYERS! SIGNATURES RED: FIND THIS STRIKING AUTOGRAPH CARD WITH A BEAUTIFUL DESIGN AND VIBRANT COLORED FOILS. CHASE STARS - GREEN: COLLECT THIS UNIQUE CHASE STARS CARD THAT WILL HAVE YOU SEARCHING FOR ALL 10 VERSIONS OF THE LEAGUES BEST PLAYERS. CHASE ROOKIES - PLATINUM: THE CHASE ROOKIES INSERT IS LIMITED TO THE 15 BEST ROOKIES, WITH 10 DIFFERENT PHOTO VERSIONS OF EACH PLAYER. SIGNATURE FILM - GREEN: COLLECT THIS AMAZING AUTOGRAPH CARD FEATURING A UNIQUE FILM CUT OF THE LEAGUE'S BRIGHTEST STARS! Weiterführende Links zu "2012/13 Panini Signatures Basketball Hobby Box NBA"
Fanbewertungen für "2012/13 Panini Signatures Basketball Hobby Box NBA"